Sampling of the Engagement Photos! 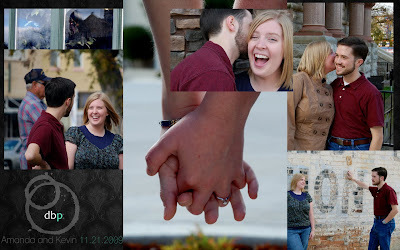 Behold a sample splash page of our engagement photos! These make me happy and excited to see all of the photos... But also eager to actually get focused on my fitness goals. My pudge seems to jump right off of the page. How is my big comeback going, you ask? Not great, but not terrible. Story of my life these days. Goals for now are: 1)start tracking all my food again and weighing in regularly. 2)stop neglecting my blog. 3)some sort of physical activity everyday. The Breast Cancer 3-Day was great, and I managed to raise all $2,300 before the big event. I can not believe we have been a part of it for three years. Amazing. My mom was here (for the walk) and we did some wedding business- twas great fun. I feel like I am actually planning a wedding now, finally. Trying on wedding dresses=hilarious. They are ridiculously heavy! Speaking of wedding dresses... I want a vintage gown. And I found THE PERFECT DRESS! Gorgeous. They pulled it out of some dusty back-room at a little private dress shop when I said that I was looking at vintage gowns. It is only $99 (woot) but it is too small (not woot.) Know what that means? I need to stop being so: Lethargic. Uncommitted. Lazy. Complacent. I am really really really trying to dig out of this giant rutty hole. I could use some help.